attributes that invite a huge pool of foreign entrepreneurs to Singapore for company incorporation. 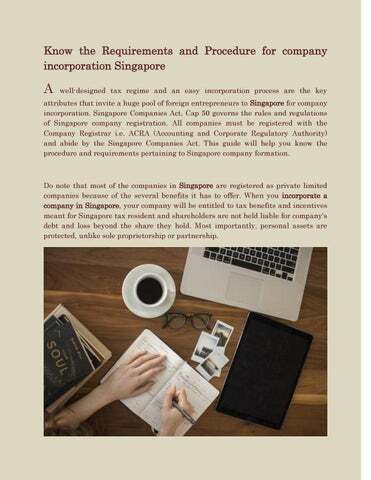 Singapore Companies Act, Cap 50 governs the rules and regulations of Singapore company registration. All companies must be registered with the Company Registrar i.e. ACRA (Accounting and Corporate Regulatory Authority) and abide by the Singapore Companies Act. This guide will help you know the procedure and requirements pertaining to Singapore company formation. Do note that most of the companies in Singapore are registered as private limited companies because of the several benefits it has to offer. When you incorporate a company in Singapore, your company will be entitled to tax benefits and incentives meant for Singapore tax resident and shareholders are not held liable for company's debt and loss beyond the share they hold. Most importantly, personal assets are protected, unlike sole proprietorship or partnership. meaning. It should not conflict with the name of existing registered business. You have to submit your online application via BizFile portal of ACRA using SingPass. Once approved, the name will be reserved for a period of 60 days. Company name approval is done within an hour. Company incorporation Process: Once the name has been approved and reserved, you are required to file the application form along with supporting documents through BizFile portal of ACRA. If necessary, documents are kept in-order, it takes hardly 1 to 3 days to complete the process of company incorporation in Singapore. Upon successful payment and submission of documents, you will receive an email notification from ACRA which officially confirm the incorporation of your business. The email contains the company registration number.